Pressform has developed the ultimate spill containment safety cage for any industry where chemicals or liquids are being transported, stored and handled. It is the essential forklift transport container to ensure all appropriate measures are in place for the containment of chemicals in the event of an accidental spill or leak. Designed to exacting standards to completely avoid the possibility of forklift puncture, the Pressform Spill Containment Safety Cage is the superior alternative to the traditional spill containment pallet. 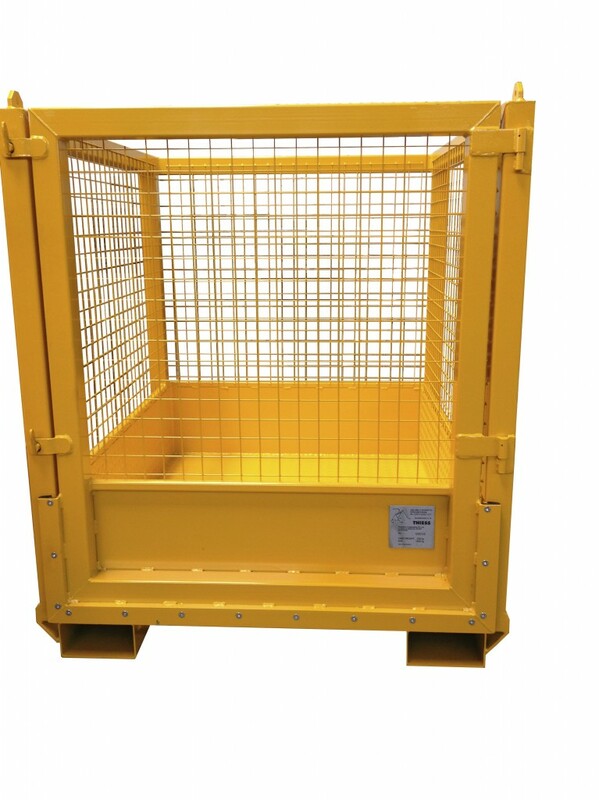 Manufactured from 3mm to 6mm steel plate, these high quality cages are bunded, have high sides and a rubber seal, that in the event of a spill during transportation, ensures any liquid will be contained within the cage. 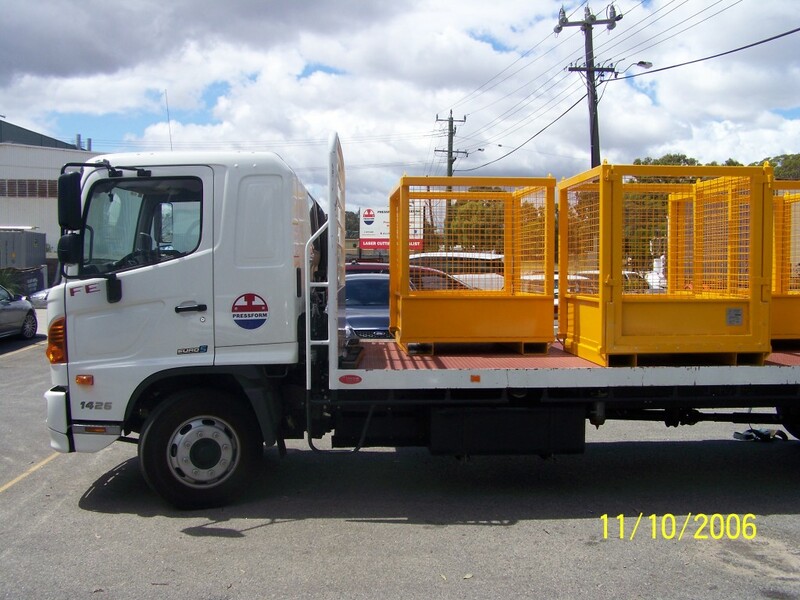 Originally developed for a major oil and gas company to transport 1000 litre IBC containers and avoid dangerous oil spills, each cage is 1326H x 1190W x 1324L in size and has a Tare weight 230kg and safe Working Load of 1650kg. Pressform Spill Containment Safety Cages are designed and manufactured in Australia to the highest engineering standards and are competitively priced. In the event of leak of hazardous chemical or substance, the unique design ensures it is contained within the 300mm high, sealed container base. The specially developed gate door and rigorously tested seal creates a reservoir of containment to allow for protection of staff, the environment and time to apply the appropriate safe clean up protocols. Manufactured in Australia from 3mm to 6mm steel plate offering strength, longevity and excellent resistance to a wide variety of chemicals. Designed to transport 1000 litre IBC containers, the cages have a Tare weight of 230kg and safe Working Load of 1650kg. Each cage is 1326H x 1190W x 1324L in size. To ensure the cages remain highly visible and durable for repeat use, each cage is painted using a heavy duty painting system in standard Safety Yellow (can be colour customised to suit individual requirements). 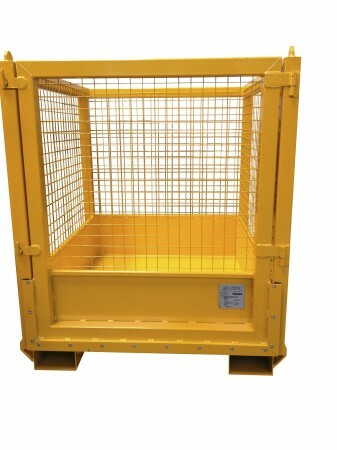 Wherever hazardous liquids require safe transport and handling, the Pressform Safety Cage is essential. Industries include: Petro Chemical; Mining, Oil & Gas; Farming & Agricultural; Trucking & Transport; Waste & Environmental. Each Spill Containment Safety Cage is made to order to exacting specifications and can be custom adjusted to suit individual requirements. Stainless and nickel alloy cages can also be offered where necessary. As a reliable specialist precision metal manufacturer with close to 40 years experience, Pressform can manufacture and deliver to meet your most urgent project requirements.